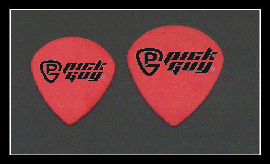 We offer single color and full color printing for custom guitar picks. Our printing is of the highest quality and very durable. for the next step in getting your own custom guitar picks! made of Delrin and have a matte finish for excellent grip. These picks are available in 6 gauges. colored by gauge and are available in 4 gauges. matte finish for excellent grip. Delrin is also a very durable material. These picks are colored by gauge and are available in 6 gauges.